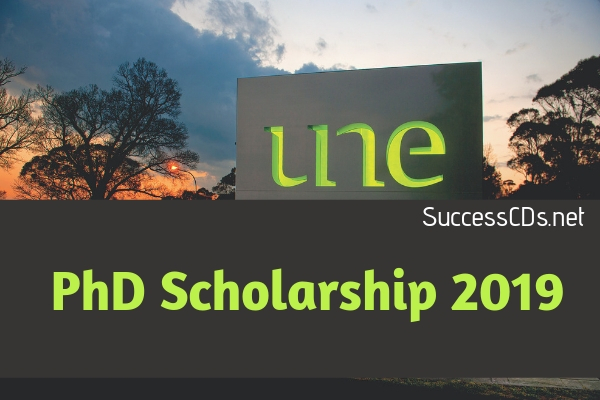 PhD Scholarship 2019 at University of New England, Australia - When it comes to education, scholarship is the best way to afford the education especially when it comes to Foreign education, it is better if you are eligible for the scholarship. This PhD scholarship is usually offered to the top-quality international candidates who aspire to enrol for the PhD.I research degree at University of New England. With this scholarship, the selected students will pursue the first and the last year of their PhD on campus, while the second and third year will be undertaken in their home country. This is the great opportunity for the students who want to pursue their PhD from the reputed University of New England, Australia. The University of New England, Australia, invites applications for UNE PhD. Innovation Research Award (UNE PIRA) Scholarship Program 2019. The UNE PhD. Innovation Research Award (UNE PIRA) Scholarship is offered to top quality international candidates who wish to enrol in the Doctor of Philosophy (Innovation) (PhD I) research degree at UNE. For students undertaking a PhD. I, the scholarship will be for a period of four years full-time. The student will be required to undertake the first and last year of study on campus at UNE. Scholarship Award: A fixed rate of AU$27,596 per annum, tax-free for full-time candidates, paid in fortnightly instalments. UNE has three teaching periods each year for most courses - commencing March, July, and November. Applicants must be an overseas student as defined in the Higher Education Support Act 2003. Applicants must have received an Offer of full-time internal HDR Candidature in the Doctor of Philosophy (Innovation) (PhD. I) at UNE but not be enrolled. Applicants must not be in receipt of an equivalent award, scholarship or salary providing a benefit greater than 75% of the Scholarship stipend rate, whilst in receipt of the Scholarship. Applicants must not have completed a research degree at the same level as the proposed candidature, or at a higher level. Scholarships will only be awarded to those students who have accepted an offer of HDR Candidature. International Scholarship recipients must be enrolled at UNE as on-campus full-time students. Selection for scholarships is based on academic merit and research performance. A high First Class Honors Degree or Research Master with Distinction or equivalent is required to be competitive for Scholarships.